One thing I hadn’t really done before today though was to investigate custom drying of ink properly. I’d seen people talk about it and I’d read about it but I hadn’t written any code with it and, usually, that’s where I learn most. That first session was recorded back in 2015 and back then it talked about custom drying needing some DirectX implementation and it seemed complex enough to put on the ‘come back to later’ pile as I didn’t have a pressing need to experiment with it. However, since then Win2D came along and added capabilities to render ink (which I used in this post) but I hadn’t thought to revisit this topic of custom drying with Win2D. 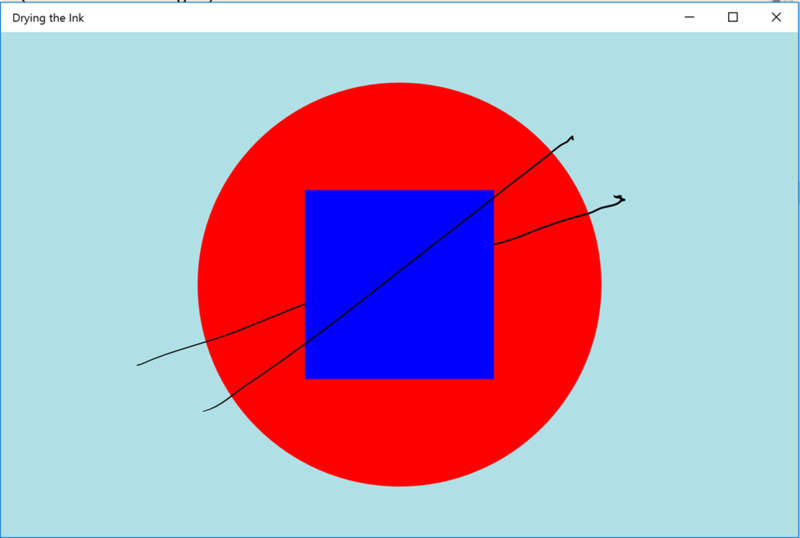 Now, it’s worth saying that there’s an official Win2D sample called ‘InkExample’ on GitHub so if you want an official view then I’d advise looking at the sample. What follows below is just my experimentation in trying to get my head around this notion of custom drying. As an aside, I did borrow a couple of pieces from that sample and they helped me a lot in understanding how this works. where the CanvasControl comes from the win2d.uwp package. // the InkCanvas has Loaded. and, sure enough, every stroke that I inked with my pen would appear on the InkCanvas in ‘wet’ form as I built it up but as soon as I released my pen, it would ‘dry’ and disappear because I hadn’t written any code to dry it. I really like these ‘wet’ and ‘dry’ terms – they’re really descriptive. The OS/platform does the work to capture the ink in its ‘wet’ form on its own thread to avoid latency etc. and then when the ink is captured, it hands it off to the UI thread to ‘dry’ it which, to me, really means to draw it in a way that’s more ‘permanent’ than the way it’s been drawn so far. The ‘wet’/’dry’ terminology captures that well. I need to transport the ink strokes from the OnStrokesCollected event handler over into the OnDraw handler so that they can be drawn. // If we only need to add some newly 'wet' ink then we do that. However, when I draw and release the next stroke, the first stroke disappears. 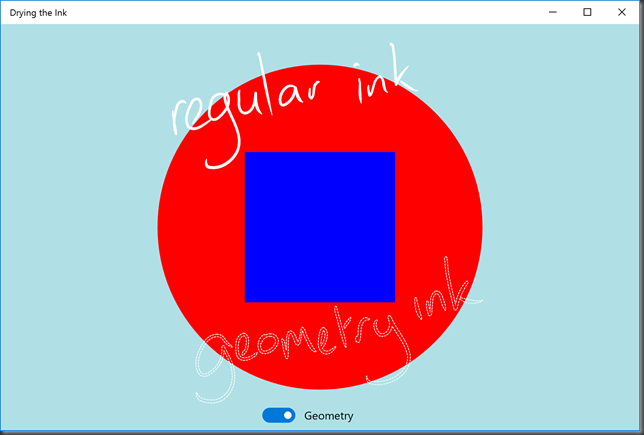 Naturally, that’s because Win2D isn’t a retained graphics system and so I need to draw everything every time, I can’t just forget the ink that has gone before. // have to clear out the render target on first use. // Draw the ink to the render target. 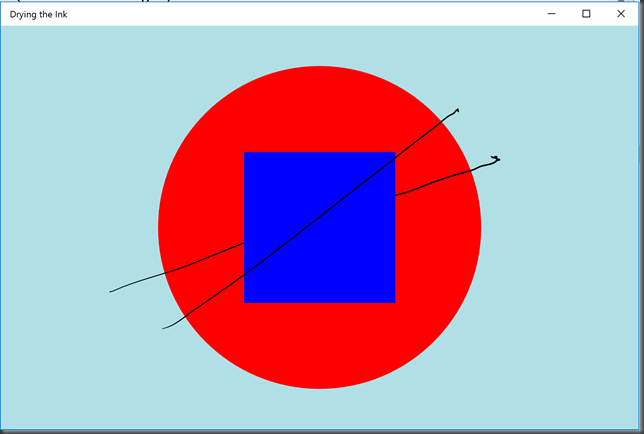 // Draw the render target to the screen. and that seemed to work fairly well although I’m unsure whether the call to EndDry here is at the right point or whether it should really be done after the last DrawImage call is made. It’s also worth saying that the official Win2d sample that I referenced does some more complex work around calling EndDry after the CanvasControl has actually rendered so it’s worth checking that out and this discussion thread around it. 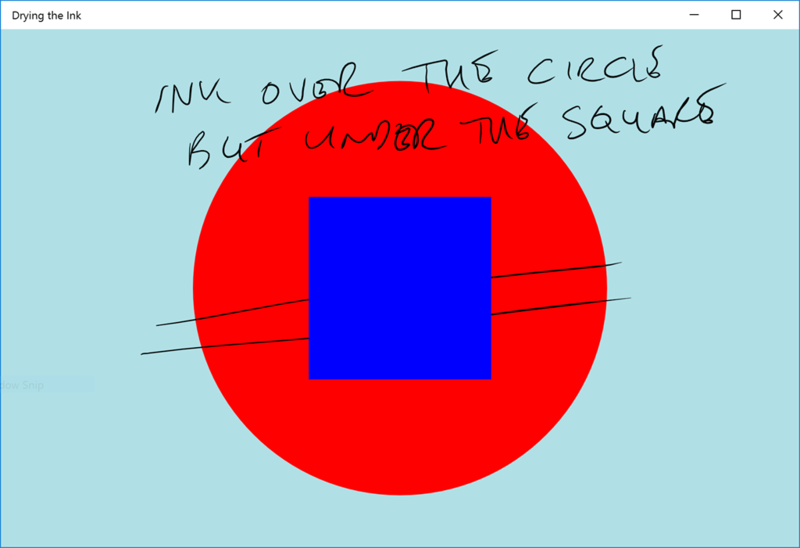 but it ‘dries’ under the rectangle and so it ‘moves’ when you release the pen which feels a bit odd but this technique opens up the potential to layer ink like this with other content. It also opens up the possibility of drawing the ink in any number of custom ways and I borrowed an idea from that official Win2D inking sample to draw the ink using an outline geometry instead of just asking Win2D to draw it directly. 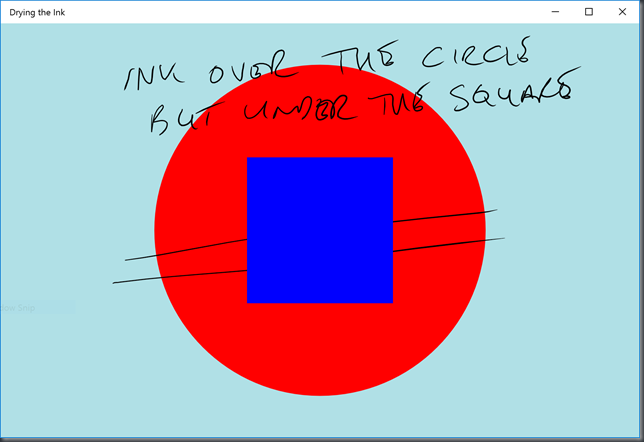 // Draw a circle at the 'back' in the z-order. // Draw a rectangle 'over' that. I daresay that I’ve got a few things wrong in there but it seems to work quite nicely and I learned quite a lot while putting it together incrementally and the sample and the article referenced earlier helped a lot. Of course, the sample should be your definitive place to go but I thought I’d write this down as it helped me get a better understanding than I had before I started on it.